Untold UFO crash incident in China. In recent years, the Chinese government has taken a more liberal approach towards disclosing UFO/ET incidents in China. One of the UFO/ET cases was reported by a retired Chinese soldier who witnessed a UFO crash on the ground of his military complex in Shanxi Province in 1997. 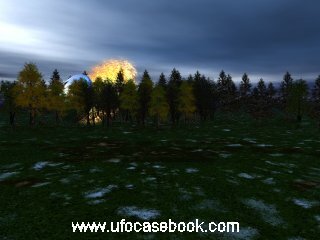 This case captured much public attention due to the sensitivity of the crash location, a military complex, and two injured aliens who were found alive at the time of the crash. One summer night in 1997, when he was serving as a soldier at 28th Army in Datong, Shanxi Province), he witnessed a flying saucer crash into the courtyard of his army camp. He quickly ran to the scene and surprisingly discovered an unidentified saucer crashed in the trees. The UFO looked like it was the same size as a satellite dish, silvery white in color. He estimated that the UFO was approximately two meters high and six meters wide. ‘There wasn’t any obvious damage on the surface of the UFO he said. This may suggest that the UFO is unlikely to have been shot down by Chinese military. He thinks that the crashed UFO may have experienced a malfunction due to weather conditions because it was a rainy night with thunderstorms. It is possible that the UFO was hit by lightning. The UFO’s door was open when he arrived at the scene. Next to the door were two skinny aliens, one appeared dead or unconscious, and the other was severely injured. He recalled the two aliens were slim and short as one meter in height, their facial and body skin covered with fur. The aliens appeared to have mouse-like facial features, or more accurately described as possum like beings. He sensed strongly that the aliens had genders, the unconscious one a male and the severely injured one a female. When he was trying to closely approach the crashed UFO to see what was happening, the injured alien looked up to him and spoke some words which he couldn’t understand. He thought that the injured alien was calling for help, but he was too scared to approach the aliens closely enough to hear them. He revealed that there were a few people that witnessed this incident shortly after his arrival. Some of them were shocked by what they saw, but decided not to disclose it as they do not want to lose their jobs if it were to go public. Later that night, the UFO and two aliens were retrieved by the military police after the crash. The entire army camp was quarantined the next day followed by a notification that no one was permitted to leave or enter the complex. All personnel involved with this incident were told not to reveal information to the public, including their families. What happened to the injured aliens and the crashed UFO are still unknown. Has the Chinese military released the aliens after medical treatment? One thing is almost certain. the Chinese government, like governments in other countries, are studying and reverse engineering extraterrestrial technologies to better equip their military defense systems and create other technology. The Chinese government has not commented on this alleged UFO crash incident to date.